What made you come out to Colorado? I moved west in ‘95 after finishing up a master’s degree program in environmental education and landed a position at the Idaho National Laboratory in Idaho Falls, Idaho. What did you do there? I was the information and education person for the ecological research group. So, when you say “lab” people picture a building with laboratories in it. This is 890 sq. miles of sagebrush steppe and the facilities take up about less than 5% of the land and the group I worked with conducted research on the rest of the land all around the facilities. When did you come to Colorado? 2006—I was a following spouse with my wife landing a post-doctoral position at the University of Colorado. What are the primary duties of your current job? 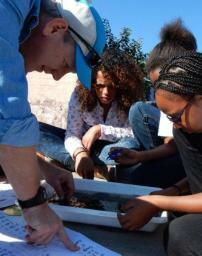 I provide the education and outreach component of the city’s stormwater system. So, underneath stormwater permits—and Denver’s is the largest size permit, being a large city—there are six required components of a stormwater system and the very first of those is education and outreach. What are your main areas of expertise? I’ve had to learn a lot about stormwater and a lot about civil engineering on the job. I do not have a background in that, so my background is environmental education focused on water. In grad school, I worked for the Sea Grant Program and studied invasive mussels for my master’s thesis… On the process side I’d say [my expertise] is program development and then program maintenance and operation. I was a small nonprofit executive director for 6 years, so I’m used to being the janitor and the mail clerk, but also the one that pays the bills and raises the money. What kinds of events are you hosting? My ideal situation is to partner with a teacher or a team of teachers at a school to co-plan and co-facilitate an entire watershed investigation. So, ideally there’s a school that has some kind of water-based unit and they want to make it both more local and relevant, but they want to move it into more of a project-based situation. The number one thing that I get judged on my job performance is the number of student-created water quality action projects that come at the end of watershed investigations. It’s the student actually doing something with their knowledge. What do they do? We’ve had water festivals that have been done by students. We’ve had trash pickups that have been done by students. We’ve had scientific symposia that have been done by students. Public service announcements. We’ve had some students that learned about a project in their neighborhood that was going to be a new park and they went to a series of public meetings and advocated for a water quality feature to be included in the park. That park is being built right now, so that was a great project. You know, we want students to combine the environmental learning that they’re doing with some kind of civic action. You know, for younger students, their community might just be their classroom or their families. 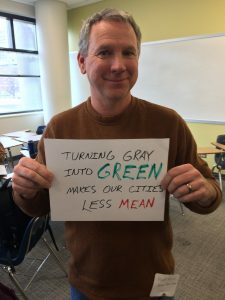 But as students get older, we hope that they broaden out and want to do something to positively affect their neighborhood, their city, their state. What made you want to become involved in the Water Educator Network? Well, I was a water educator without a network. And then there was a statewide network of people doing exactly what I do. So, that was still when I was just trying to figure out who is else is doing what I am being tasked with doing—working underneath a stormwater permit and providing education and outreach. 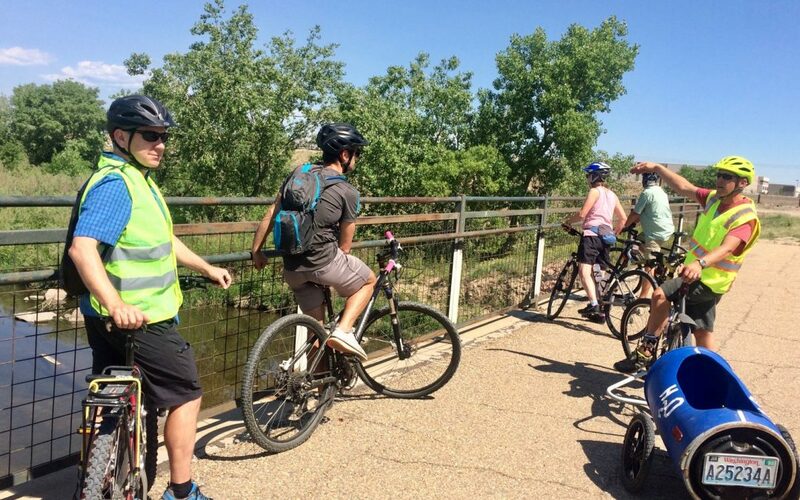 What is your favorite Water Education Colorado workshop or event that you’ve attended? I’m gonna say that it’s the Colorado Watersheds Conference and that’s because I don’t get to go every year. The North American Association for Environmental Education, which is actually a global organization, does a conference for the environmental educators usually at the exact same time… I like [the Sustaining Colorado Watersheds Conference] just because it’s such a broad range of topics, so I can really go in and hear about work that’s all over the state that’s really in different areas. You know water, along with air, is about as broad an environmental topic as you can get. So, it’s when you start drilling down and start hearing both about people doing super cool technical stuff and also people spreading the word and different ways of doing that. I find that being in Denver, we get insulated with just the urban issues and that I have to be gently reminded from time to time about things being different outside of Denver, outside of the metro… The things that we pay attention to are just different. But the things that hold us together are common as well. We all want clean air, clean water and clean land to live on. Describe your proudest water-related accomplishment? As the father of a teenage daughter who has picked up a thing or two, I’m remembering last summer when she was a junior counselor at camp. This is going to be a surprise to any parent, but she behaves differently when I’m watching versus when I’m not around. But in the middle of the day I got a text from one of the educators at the camp where she was saying, “Uh, Nora is totally schooling all of us on macroinvertebrates.” And that made me pretty proud you know, that it had been passed along. Had to play the proud papa card there. What else do you do in your free time? I’m a hiker, so my happiest times are on trails. What is your biggest goal for the next year, professional or otherwise? This school-based approach that we’ve got in Denver—it’s my goal to keep it going; to keep it strong and vibrant. And to meet the goals that both the city gives me and then the ones that I have myself, which is to really get young people, through the lens of water, working on neighborhood issues. You know, seeing themselves as connected to their community, but then able to affect positive change in their community.